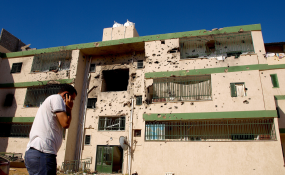 The scars of war in Tripoli's Abu Salim district. Libya's government has announced a state of emergency in the capital and urged rival militias to stop the violence. At least 39 people have been killed in ongoing clashes between armed groups vying for power. Libya's UN-backed government declared a state of emergency in Tripoli on Sunday after days of fighting left at least 39 people dead and dozens more injured. "Due to the danger of the current situation and for the sake of the public interest, the presidential council declares the state of emergency in the capital, Tripoli, and its suburbs to protect and secure civilians, public and private possessions and vital institutions," it said in a statement. The government also called for militias to end the violence and respect a UN-brokered cease-fire. Ongoing clashes between warring groups broke out in the suburbs south of Tripoli on Monday. According to the health ministry, some 100 people have been wounded in the unrest. Armed militias have been battling for control of the Libyan capital since the overthrow of dictator Moammar Gadhafi in 2011. Jihadist groups, such as the so-called "Islamic State," have also exploited the political turmoil and lawlessness to gain a foothold in the North African country. Libya is governed by rival authorities -- the internationally recognized government operates from Tripoli in the west, while the other is based in the eastern city of Tobruk. Each one is backed by several militias. In a statement issued on Saturday, UN Secretary-General Antonio Guterres condemned the escalation of violence, "in particular, the use by armed groups of indiscriminate shelling leading to the death and injury of civilians, including children."